Jeff is the founder of Amazon. He left a high-paying job to start his own .com business in 1994 and everyone thought he was crazy? Well, 23 years later.....He has created an empire ! There’s a lot to be learned from Jeff about business. I’ve just watched this cool video that lists Jeff Bezos's top 10 rules for success, taken from his various interviews and speeches. This is valuable for all entrepreneurs even if you are trying to find focus, direction and ambition in life. He is one of my role model's and I hope you’ll find this useful. One of my other challenge was that I wanted to have the "PERFECT first post", like a Disney blockbuster which has all the right ingredients and perfect story telling. I was waiting for an inspiration which will somehow make the perfect first post on LinkedIn, maybe some sort of celebrity endorsement of my unknown stature in the world of LinkedIn which will launch me into stardom and make me into a star (secretly wishing that people will line up to take selfies with the "guy with the PERFECT first post" lol). I was walking by the CIBC HQ last week and I saw Victor Dodig(CEO of CIBC - for those who do not know, he love's selfies). I walked up to him and asked, "Victor, you mind if we took a selfie with you?". It all went smoothly and you can see the picture above. After I took the selfie, I thanked him and started walking to my office but my mind was racing from one thought to another. It went something like, "I have just got a selfie with one of the top financial leaders in Canada and maybe I can now go and write my perfect first post(hopefully be known as 'The guy with the PERFECT first post' then I just need to wait for 10000 likes and 100s of comments lol). Last week someone showed me a finger while I was driving. The person was trying to make a right turn and I happen to be coming in that lane. Clearly I was not doing anything wrong but my fellow human was really upset. His reaction made me angry(automatically) and also curious as to why am I getting angry at angry people? I got better things to do but the almost instant brain response to threat was anger. A complicated threat (it is unknown to my primitive brain as no wild animal was attacking me) made by a hand gesture which was learnt as a theory by my modern brain to be perceived as an attack on ego. Anger is a is nothing more than a defense mechanism created to hurt others but, in the end, it only hurts one person: Myself. The Neurological Imperative: Conserve EnergyThrough the process of habituation, a perception of ego vulnerability, repeated over time, consolidates into a presumption of vulnerability, which requires the continual protection of anger. Also by virtue of habituation, the repeated experience of anger in defense of the ego reinforces its sense of vulnerability. 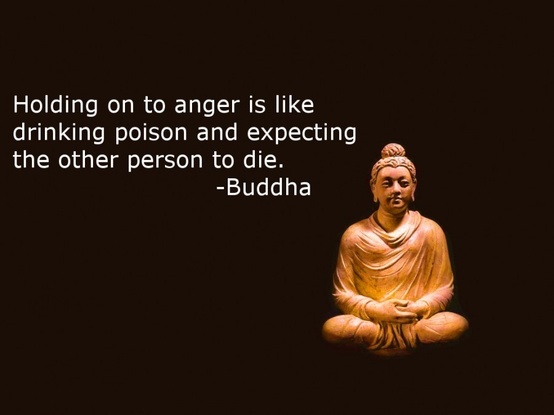 The more you experience anger, the more anger you need to experience. InflationIn addition to needing more and more protection from threat, the angry person attempts to reduce the fear and sense of inadequacy (shame) that go with a vulnerable ego, through a process of inflation. An inflated ego is one whose value depends on downward comparison to the value and rights of others - I'm not equal, I'm better! In addition to temporarily making the ego feel less vulnerable, inflation justifies the motivations of anger to prevail and dominate. It also creates a sense of entitlement - I deserve special regard, treatment, or resources - that is certain to cause negative reactions in others and require a response of still more defensive anger. As if that weren't bad enough, inflation guarantees cognitive dissonance whenever reality smacks against the overestimation of intelligence, talents, looks, shoes, or socks - whatever is used to inflate the ego. Thinking Overload - Let Go ! Do you have space in the mind? Let go - this is the week of letting go. Let go of expectations, desires, obsessions, anger, mindlessness, exhaustion. BE and let go of all these habits which fight back with you - trust in the power of highest potential and let all these go to that power. Trust that whatever will manifest after letting go will be the gift. OM LAGHU BHAVAM is sanskrit for I am lightness itself. Think about it and focus on your breathing. Let go ! As you breath you will make space inside your mind and body. Pay attention to it and let wrap you in silence and peace in the vast empty space of unconditional love and acceptance. 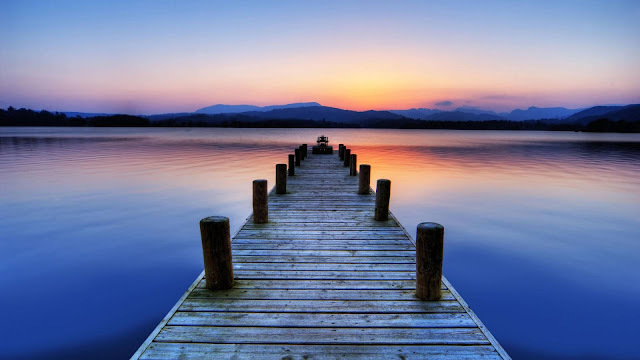 Mindfulness is a state of active, open attention on the present. When you're mindful, you observe your thoughts and feelings from a distance, without judging them good or bad. I am open to receiving peace in this moment; in the seeking and finding I am open to be receiving. I let go of resistance and surrender to this moment of now. I slow down, give up my past and future. I am ready to be in the moment ready for whatever happens. By: Deepak Chopra M.D. and Rudolph E. Tanzi Ph.D. I recently received a copy of this book and really enjoyed reading it. 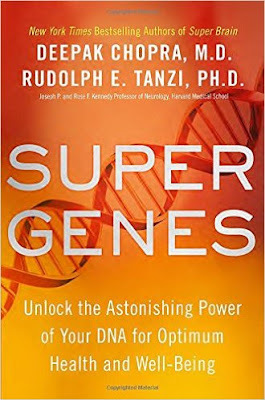 correlate the complex gene activity that produces happiness; in the meantime, the super genome connects all the input that life brings us. Let's contrast the kind of input that promotes beneficial gene activity with the kind that creates damage. Both lists contain items you are quite familiar with by now, but it's good to see everything gathered together. How often do you feel overwhelmed and disorganized in life, whether at work or home? We all seem to struggle with time management in some area of our life; one of the most common phrases besides "I love you" is "I don't have time". Everyone suggests working from a to do list to start getting your life more organized, but why do these lists also have a negative connotation to them? Let's say you have a strong desire to turn this situation around with all your good intentions—you may then take out a piece of paper and pen to start tackling this intangible mess with a "to-do" list. What usually happens, is that you either get so overwhelmed seeing everything on your list, which leaves you feeling worse than you did before, or you make the list but are completely stuck on how to execute it effectively. "To-do" lists can work for you, but if you are not using them effectively, they can actually leave you feeling more disillusioned and stressed than you did before. Think of a filing system: the concept is good, but if you merely file papers away with no structure or system, the filing system will have an adverse effect. The same with "to-do" lists—you can put one together, but if you don't do it right, it is a fruitless exercise. The following article is from Scott H Young. I have been following his website for a few years now and this is my favorite article. Have you ever wanted to learn something, but weren't sure where to start? Maybe you want to learn a language, programming or business. Maybe you want the confidence to tackle supposedly "hard" subjects like math, finance or physics. Today I'm going to show you how. I'm going to describe the process I've used to condense a lot of learning into a short period of time. This is the same process I used to learn MIT's 4-year computer science curriculum in twelve months, teach myself languages, business and intellectual subjects like physics and psychology. This article is going to be a bit longer (~3500 words), so you may want to bookmark it for later. I'm going to focus on the strategy for learning, meaning how you choose to break down a nebulous goal like "learn to speak French" or "understand personal finance" into something concrete and actionable. As much as possible, I'll try to provide links to specific low-level tactics I use, such as the Feynman technique, visual mnemonics or active recall as well. This strategy is just one possibility. If you've found success with another, by all means, go ahead! I only want to share the method I've been honing for years across a variety of different subjects. Take your learning goal, and craft it into a compelling, obsession-worthy mission. Find material to learn from, structure it into a flexible curriculum. Define feedback mechanisms to constantly direct your future learning efforts and ensure high-intensity, active recall. Test and enforce a schedule that is sustainable over the entire lifetime of the project. Develop a long-term retention strategy (formal or informal).